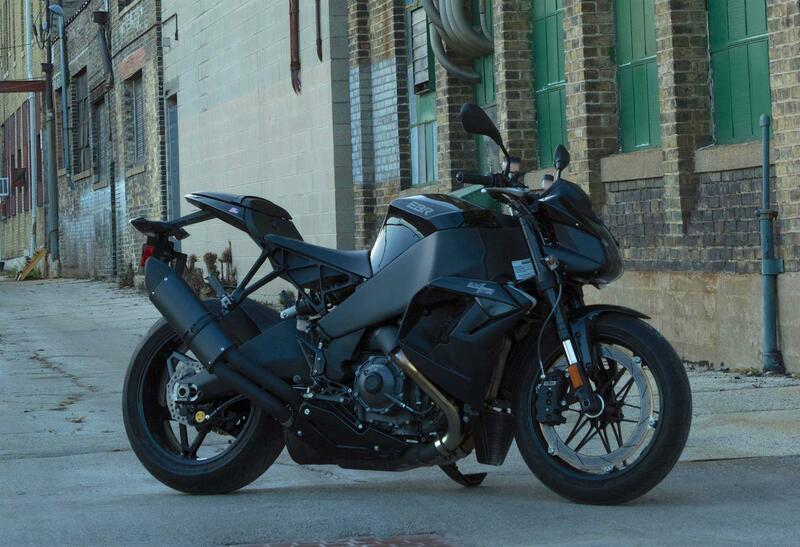 EBR Motorcycles, founded by engineer Erik Buell, have unveiled the Black Lightning – a street focused version of their 1190SX. The Black Lightning is the first new model from EBR Motorcycles, formerly EBR Racing, and is the subject of the teaser “something quick, dark and low” that came earlier this year. Although we must admit we were hoping for a mad Diavel-esque cruiser, the Black Lightning does sound like it has a heap of potential. The core of the Black Lightning is the water-cooled 1190cc v-twin engine, which has been made in-house ever since EBR bought the rights off Rotax. EBR claims the 72-degree twin puts out 185hp and 101ftlb of torque. EBR say the Black Lightning has been adapted to make the bike more suitable for street riding as the seat height is lower (as are the footpegs), the bars are higher and the gearing has been lowered to give it better acceleration. EBR have suggested the Black Lightning will retail for $13,995 but with the pound weak against the US dollar, it’s anyone’s guess how much the bike will be in the UK. The introduction of the Black Lightning does also leave us with two questions: what is the fate of the long promised 1190AX adventure bike and when can we expect the sub-$10,000 that has also been promised?